I once read that the good thing about short stories is that they are short… how true! This book is a collection of 13 wonderful and entertaining short stories, each with it’s own distinct flavor an personality. At some times I was thinking there was kind of a disconnect with each story I was reading and it seemed rather random. But after I was finished and thought about it, I could see how the differences made it what it is. I guess you have to read it to understand what I mean… 🙂 There is a randomness it’s true, but there is also a cohesiveness that makes it work. Sometimes comical, always moving, and often starkly painful, the stories in this unique collection share one overriding similarity: an extraordinary ability to reveal the deep psychological complexities of the human experience. 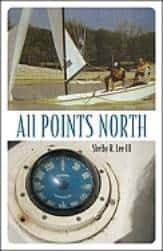 In All Points North, author Shelby Lee targets the unseen mental landscape that informs our daily lives. Here are 13 short stories that trace the roots of grief, anger, psychological torment and sorrow, and shine a much needed light on our seemingly unexplainable behavior and attitudes.